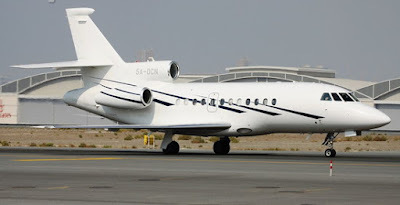 Israeli newspaper Haaretz reports in its Hebrew edition today that the private Dassault Falcon jet 5A-DCN belonging to Libyan leader Muammar Gaddafi had flown to Minsk, in Belarus. According to a new flight-plan filed this morning, the 5A-DCN – which landed in Minsk on Friday afternoon – was destined to arrive in Tripoli at 12:30pm, having left Minsk at 9:30am (CET). The plane is believed to have landed in Mitiga airport, east of Tripoli. Air spotters on Twitter and internet fora today noted that the Dassault Falcon had been “heard working with Hungarian and later Malta air control”. Haaretz reported that it was unclear whether this was the same plane which the Lebanese transport minister had refused landing last Wednesday in Beirut. The plane was believed to be carrying a Gaddafi family member. The Maltese government this week also denied that the name of Gaddafi’s daughter Aisha had been among the 14 passengers refused landing in Malta on Thursday. The Dassault Falcon jet is one of three planes used by Gaddafi – the other two are an Airbus 300 and 340. It is unclear who was flying on the Falcon jet. “Belarus is a country of refugee dictators. Controversial figures hosted in the past include the deposed president of Kyrgyzstan, Courmnbeak Kiev, and the Holocaust denier Jürgen Graf. Belarus had also agreed to grant asylum to Serbian dictator Slobodan Milosevic, who was a close ally of Lukashenko,” Haaretz said.